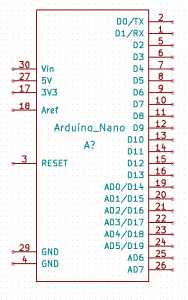 Recently I wanted to get some circuit boards made up as a carrier for the Arduino Nano and I couldn’t find a decent library file and module for kicad, my EDA weapon of choice. I suspect maybe it was just my google-foo letting me down, but there were some truly useless library files out there on the interwebs for the Nano, whereas there were some great libraries including 3D models for some of the other models of the Arduino. Go figure. Pop a comment down below if you find them useful, I create a lot of custom library files for Kicad but most of them are pretty specific to what I need and never see the light of day. I thought these ones were a bit more applicable for others to find useful. Testing 123, SOTA on the lawn.